Back in the winter, I mentioned that my favourite evergreen tree was the White Pine. It might actually be my favourite tree period; certainly when I walk through a place it’s the only species that I always take notice of and remark upon, breathing deeply of the delicious piney scent , and the one species that’s on my wishlist for a home. 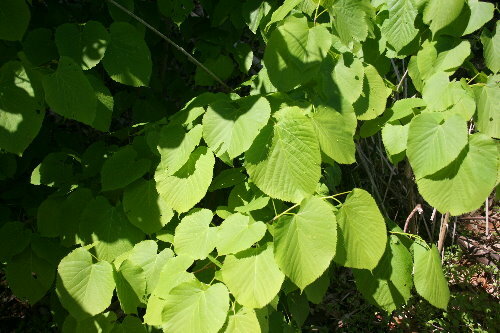 However, my second-favourite tree, and my favourite deciduous species, is the basswood, Tilia americana. I’m not sure what it is that appeals to me so about it; perhaps it’s the oversized leaves, which look like something that belongs in a tropical rainforest down near the equator, not growing in a temperate forest in Canada. There are some 30 species of Tilia, all found in the northern hemisphere, but only the one, Tilia americana, grows in Canada. There are an additional five or six found in the US. 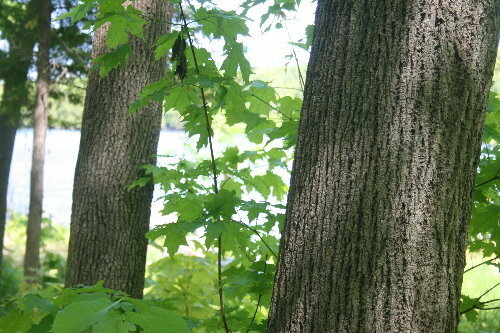 The entire genus is usually labeled basswood in North America, but because of its unique status in Canada as the sole representative of its group, T. americana gets the designation Basswood, as in the basswood, here. 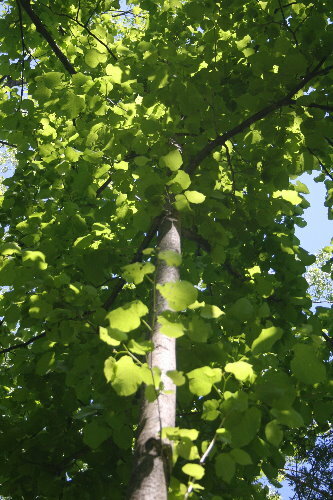 It is sometimes also called American Basswood, American Linden, or Lime-tree. The latter two (linden and lime) are names more commonly used in Europe for members of the genus. I get the impression that here in North America the use of linden is mostly restricted to urban plantings or nursery stock. As I mentioned, the leaves of this species can grow to huge sizes. The one shown here is probably 6 inches (15 cm) wide and 7 inches (17.5 cm) long, but it is somewhat exceptional. 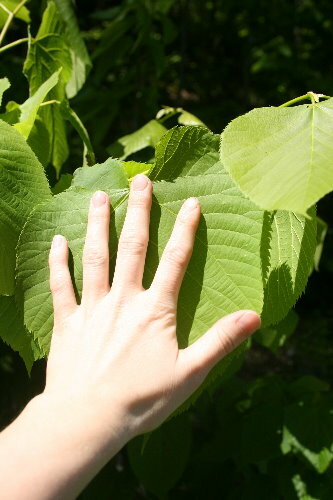 The average size of leaves is usually only about 4.5 inches wide, although as with all trees measurements vary greatly from one leaf to the next. Here in Ontario I can’t think of another species, at least that occurs regularly in the province, whose leaves achieve such sizes (unless you consider compound leaves for their whole leaf and not the individual leaflets). Sycamore or some of the oaks might come the closest, or perhaps pawpaw, which occurs in the far southwest of the province but not in any of the areas I’ve ever lived. Of course, for really big leaves in Canada the Bigleaf Maple is unrivaled, with leaves reaching 12 inches (30 cm) across. They’re only found in BC, though. The trees are usually medium-sized, growing up to 60-70 feet (18-21m) tall, and reaching perhaps 2 feet (60 cm) in diameter, although there are unusual individuals that do get larger than this. I don’t think I’ve ever seen a basswood that’s reached 2 feet in diameter, however; most of the ones I’m used to seeing are less than half a foot, relatively small trees by forest standards. Some of the largest basswoods I’ve seen are growing here on our property in the Frontenac Axis. For instance, the tree on the right, a basswood, is probably a foot in diameter. 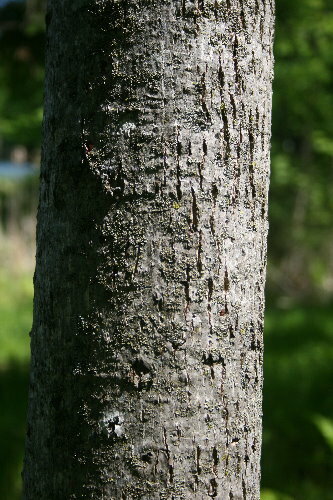 Although the trees start out with smoothish bark when young, as they age the bark furrows into ridges. The tree behind and to the left is an ash of indeterminate species (the ashes are always so tricky to tell apart). I’ve always considered these deeply-furrowed trunks to be ashes, but I won’t be able to so blithely label these winter trees as such anymore, having seen these older basswood. This is more typical of a younger basswood. The inner layers of younger bark is fairly supple and will peel away from recently dead wood in long fibrous strips. If peeled carefully, it’s possible to get long, thin tendrils that can be woven into very sturdy bark fiber ropes. 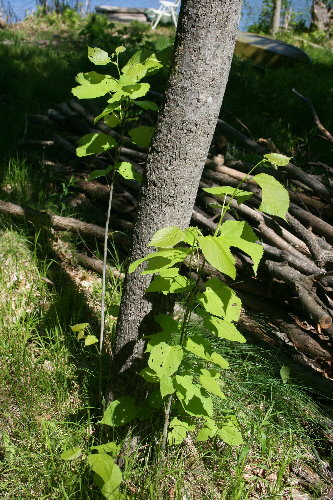 Native Americans used the basswood as one of their primary sources for rope fibers. Once dry, the fibers can be wrapped carefully into a very strong piece of cord and used either as a tie, for fishing, or in weaving. Basswood have deep, wide-spreading root systems that provide strong support and nutrients. They are one of a few species that are capable of regenerating from stumps if the tree is knocked or cut down. This may result in shrub-like clumps or in several mature trees clustered tightly together. 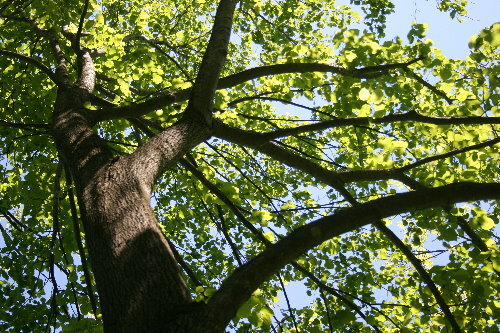 The tree doesn’t necessarily need to be cut for sucker saplings to start growing from the base, however, particularly in areas where the tree is getting a lot of light. Our landlord, a couple years before we moved in, had thinned out the forest in front of the house to better improve the view of the water, which means the trees that remain there are now receiving much more light than they did when the forest was intact. They have one of the softest and lightest woods of Canadian hardwoods, and are as such a favourite for various carving and furniture projects. It has virtually no knots or grain, which may or may not be ideal depending on what you want of the finished product (for instance, the lack of grain means that when stained they don’t show much of a wood pattern). Flowers are produced relatively late, for a tree, appearing mid-summer in July. They are extremely popular with pollinators such as bees (leading to the colloquial name of “bee-tree”), and you can buy basswood honey made almost exclusively from the pollen of these trees. One online store describes basswood honey as “delicate and mild, and has warm herbal notes and a clean finish.” Sounds like they could be describing a wine. I don’t eat honey much, but I would be intrigued to try it (or some other non-traditional types) if I stumbled across some. Thanks for sorting out the nomenclature. I usually call this tree a Linden, but only when I recognize it by its flowers, which are sold commercially as a herbal tea (I’ve never seen “basswood tea” on store shelves) . The tea is mild and pleasant, so I’m not surprised to learn that honey from basswood flowers would be described that way too. In my area we have at least one species with leaves that large – the invasive Norway Maple. They’re pretty much everywhere because they were planted as street trees. I’m not really familiar with basswood; I’ll have to keep an eye out for them. Yup. We used to raise bees when I was a kid, and we could always tell the basswood honey by color (light) and taste (delicious). I’ve heard that basswoods are a good bioindicator of an unpolluted watershed. Another giganto-leafed tree is the Catalpa. I have a large one in my yard and find it one of the most weird and interesting trees to look at. Not only the size and shape of the leaves but the humongous seed pods it produces. Reminds me of something out of the dinosaur age.